Insulation Quotes Require Careful, Precise Measurements | DR Foam Insulation Services Ltd. Insulation Quotes Require Careful, Precise Measurements | DR Foam Insulation Services Ltd. Here at DR Foam Insulation Services Ltd., we pride ourselves on the quality of your insulation services and our cost-effective prices. 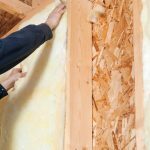 Adding new insulation to your home can greatly increase its energy efficiency, which will result in lower utility bills and improved home comfort for you, especially in the winter months here in Canada. If you have decided to invest in insulation, we will start off the process by providing you with an accurate quote. Before we can give this quote, however, we will measure the area where you want the insulation installed. To do this, we use basic geometry to determine how much insulation we will need for the project. First off, we measure the width of one exterior wall from the outside of your home. If the wall cavity is open, however, we can measure from the edge of a corner stud to the inside edge of the corner stud opposite from it. We then measure how tall the wall is from the bottom of the ceiling joist to the top of the floor joist. After we have these two measurements, we get the wall’s total square footage by multiplying them. We then measure the width and height of any doors or windows in the wall to get the area of these features. Then, we subtract them from the wall’s overall square footage. We complete this process for every wall requiring new insulation before giving you a quote. For more information about our services or to schedule an estimate, reach out to us today!